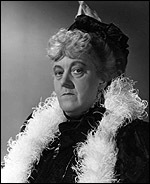 Margaret Rutherford was a much-loved English comic character actress, her quiddity summed up in The Demi-Paradise (d. Anthony Asquith, 1943) where Penelope Dudley Ward tries to explain her to Olivier 's Russian visitor and ends up just laughing helplessly "Well, you've seen her for yourself!" Her dumpling shape typically tented in capacious blouses, skirts, and capes, often of clashing patterns that lent oddity to their determined sensibleness, she played a succession of indomitable spinster enthusiasts and determinedly sexless, often authoritarian, eccentrics, both middle-class and aristocratic, as well as pursuing a notable stage career. She was originally a teacher of elocution, which left its mark on the highly developed comic instrument of her voice. In films from 1936, in 1945 she played the first of her great roles (which she had also performed on stage), the clairvoyant Madame Arcati in Blithe Spirit (d. David Lean, 1945). She was unflappable as Nurse Carey, undisturbed that Glynis Johns was a mermaid, in Miranda (d. Ken Annakin, 1948), academically absorbed as Professor Hatton-Jones proving Pimlico to be Burgundy in Passport to Pimlico (d. Henry Cornelius, 1949), and inimitable as that distant daughter of Miss Buss and Miss Beale, Miss Whitchurch, headmistress of St Swithin's, locked in conflict with Alastair Sim , in The Happiest Days of Your Life (d. Frank Launder, 1950). She was Miss Prism in The Importance of Being Earnest (d. Anthony Asquith, 1952), a petshop owner versed in animal languages in An Alligator Named Daisy (d. J. Lee Thompson, 1955), and quite properly part of those self-conscious celebrations of British cinema, The Magic Box (d. John Boulting, 1951) and The Smallest Show on Earth (d. Basil Dearden, 1959). Surviving into the age of satire, she played Ian Carmichael 's aunt in I'm All Right Jack (d. John Boulting, 1959) and then attained a more foregrounded stardom as a robust serial inflection of Agatha Christie 's Miss Marple, beginning with Murder She Said (d. George Pollock, 1961). Orson Welles made art-house tribute by casting her as Mistress Quickly in Chimes at Midnight (Spain/Switzerland, 1966), the year she was made DBE, and after she had won the Best Supporting Actress Oscar in The VIPs (d. Anthony Asquith, 1963). She was long married to Stringer Davis .